Over the past few days, I’ve had the pleasure of meeting with a lot of volunteers to record their stories about why they volunteer and their favorite memories. I have to say, that’s my next tip for healthier living. Try to find the time to get out there and volunteer in your community. It makes you feel better, you get the opportunity to meet people that you never would have met before, and you’re giving back to the community. 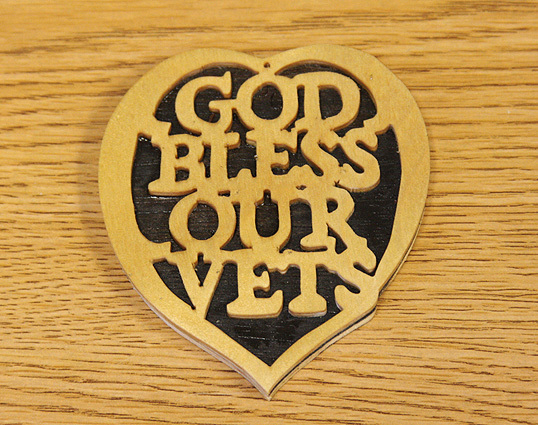 Mr. Burkhart is also a skilled scroll saw craftsman, and this is the part that was truly touching. Not only does he volunteer at the hospital, but he spends time at home creating decorations that he is giving to veterans who work for Meritus Health. He’s given out between 50 and 60 personally created scroll saw pieces, and once he’s given as many away to employees here as he possibly can, he’s going to make more for members of the American Legion post he belongs to. I'm in awe- this is so intricate, yet it fits in the palm of my hand. Mr. Burkhart, I feel like you should be recognized. You are an inspiration. Thank you. The scariest night of all is here! Want to avoid getting the flu? Get low, low, low, low! Do you take more than one kind of medicine?